To read more about our recycling take a look at our brochure guide. 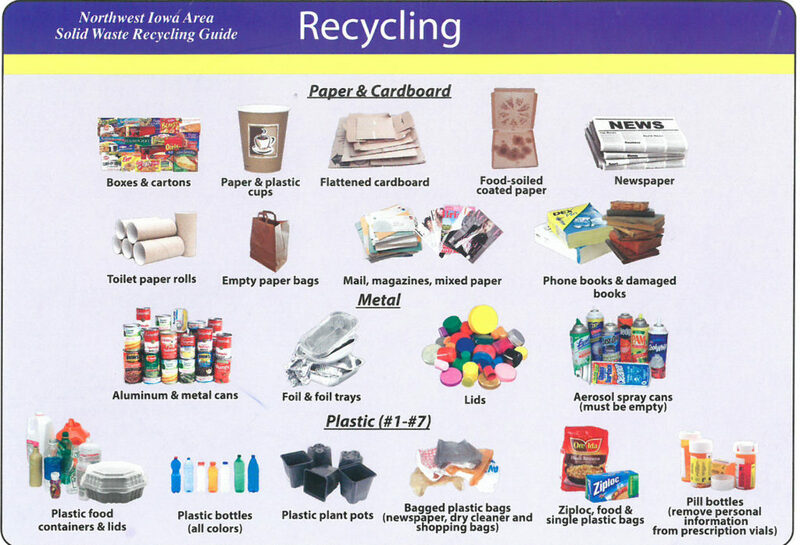 The NWIASWA recycle 1-7 plastic containers. This includes: Milk and juice jugs, pop and water bottles, dish and liquid soap bottles, bleach and detergent containers, ice cream tubs and yogurt cups, cooking oil containers, lotion bottles, household cleaning containers, plastic bags and plastic food wrap, plastic cups and plastic plant pots. All containers must be clean and contain no liquids. Office paper, envelopes, junk mail, newspaper, brown paper bags, magazines, phone books, catalogs, books, paper egg cartons, cereal boxes, pop boxes, paper cups and corrugated cardboard. Please keep materials dry and do not put out for collection on rainy days. Aluminum and metal cans, foil and foil trays, lids and aerosol spray cans (must be empty). Please rinse out recycling containers; just a little bit of effort will reduce the smell in your recycling bin and ensure your bin does not attract unwanted guests.